A couple of years ago, as a Hetas installer, I fitted a stove for Beth, a friend of mine. Beth has a large L-shaped open-plan living area (although the stove area can be sectioned off using two large doors). Beth easily manages to heat the local area that the stove is in but has said that the stove struggles to heat the rest of the open plan living space. 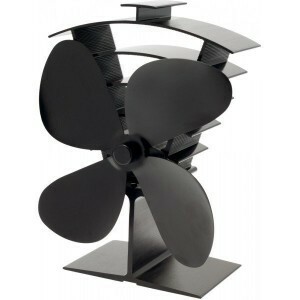 We just got some new Valiant stove fans in and I thought that she would be a good test case for the Valiant 4-bladed fan. I was surprised at her initial reaction when I offered the stove fan, something along the lines of “I can’t see it making much difference with our open plan space”. BETH: Yes of course. How much are they bcos i cant give it back now its too good!! 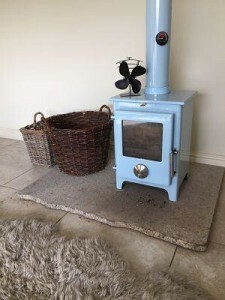 My own experience of using a fan (in a more typical 5mx5m room height 3m) is that the room is warmer than usual with less fuel used (my wood burner is the blue Trianco pictured). I suspect that this is because the fan is moving warm air away from the stove and towards where we are sitting before that warm air has chance to rise up the ceiling (hot air rises). At the same time warm air that has risen is being sucked back down for recycling . Try standing on a chair and see how much hotter the air is just below ceiling level in a room with a stove and no stove fan! The fan move air around so the hot stuff is not just sitting still above our heads. There certainly is a difference, a small but noticeable difference in room temperature in my lounge but a more noticeable and surprising difference in fuel usage. The larger the room, or the higher the room, then the bigger the difference is my assumption.